B”H Yesod Yosef distributed Shabbos assistance to 15 poor families. 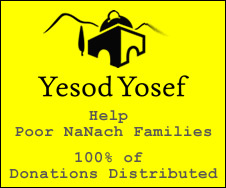 One loan was granted via theYesod Yosef Interest Free Loan Gemach. Donors were prayed for by the Kivarim of Rebbe Elazar Hamodai, Yonasan ben Uziel, Binayahu ben Yehoyada, Rebbe Nachum Ish Gam Zu and Binyamin HaTzadik. We see here that sometimes a person is destined to loose that amount anyway and by giving it instead to Tzedaka he mertis a tremenddous Mitzvah.